As a widow in her 70s, my mother terrorized several counties in southern Idaho with her erratic driving. She loved to drive fast, but often forgot about rules and regulations. Once she was speeding on the freeway and a patrol car followed her for 10 miles, lights flashing, before she noticed and pulled over. She got away with just a warning because she had made some grape jelly just that morning and gave several jars to the nice officer. Mom never wore a seat belt, despite my warnings and pleadings. She had driven for almost seven decades without a seat belt and wasn't going to change. She was irritated when her new car made noises if the belt wasn't fastened, so she sat on the buckled belt. The least I could do was make sure her car had working airbags. 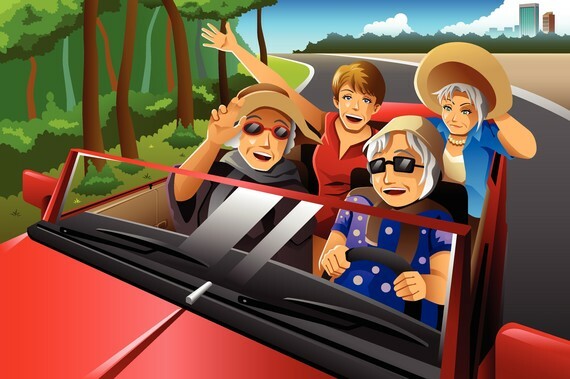 As she got older and continued to drive too fast, I received telephone calls from her worried friends. No one would drive with her, and they formed a secret society to cajole her into being a passenger in their cars. She thought she was quite special because everyone wanted to take her places. The truth was, they just wanted to get there alive. I lived 100 miles away, but with each visit I noticed more dents and dings on her car. Soon it resembled a vehicle in a demolition derby, and I knew I had to do something. She lived alone and had been widowed for twenty-five years after my father died, and her car was her proof of independence and mobility. I was preparing The Talk about taking away the keys when another incident occurred, and this one was serious. Mom was in her 80s when she drove her car into the back wall of her garage, panicked and threw the car into reverse and then crashed through the closing garage door behind her. The car had to go. First, I made sure she was okay and hadn't injured her neck or back. Then I arranged for the garage wall to be fixed, a new garage door installed, and extensive damage repaired to the front and rear of her car. The car was moved to a repair shop. She remained in denial. "There was ice on the floor and the car slipped, and I always knew the garage door was faulty," she said as I made her some tea and prepared for The Talk. "As soon as the car gets back from the shop, I'll show you I can still drive." I poured the tea and arranged a plate of her favorite chocolate chip cookies. One bad habit I learned from my mother was to eat cookies during stressful situations. Obviously, by the increasing size of my belly, I had endured a few too many tense discussions. "Mom, isn't it great that your friends are taking you where you need to go?" I asked, asserting my best positive attitude. "Oh, yes," she answered. "But Evelyn drives so slowly. It took us thirty minutes to get from Wendell to Twin." "It's a thirty-mile drive, Mom. And there are stoplights and traffic. It should take that long." "I used to make it in 20 minutes. Even in the winter." I cringed and silently thanked her weary guardian angels. "Several of your friends have told me how much they enjoy your company. Couldn't we just keep that arrangement going? Maybe you don't even need a car!" I felt my stomach churn. I didn't like parenting my mother. She stopped mid-chew and looked at me. It was an awkward silence. "I want my car," she said. Then she shoved the rest of the cookie into her mouth. I did the same. An image appeared in my mind of 20 years in the future when my daughter would be attempting the same discussion with me. I grabbed another cookie. She'll have to pry those keys from my cold, dead fingers, I thought. That's when I knew The Talk was futile. "Okay, Mom. We'll just need to wait on those darn parts to arrive." She smiled and sipped her tea.I didn't have the heart to tell her the repairs would take several years, and she would never drive again. Walls and doors can be repaired. A child on a bicycle was a bigger concern, and her driving wasn't safe. Every few months after the incident, she would ask about the car. "Still in the shop waiting for parts," I would answer. She always shook her head and muttered about the lack of good customer service these days. 1. Prepare and rehearse your talking points. List positive facts, such as having a goal to reduce expenses for maintenance and insurance. 2. Be honest. Gently remind your parents that you respect their need for independence but you're worried about their abilities to drive. Enlist advice of other siblings, trusted friends, or a physician. 3. Offer transportation alternatives. Arrange for a weekly taxi service or set a schedule to take her along on excursions. As Mom's health declined, I often hired a medical taxi that could help with wheelchairs and mobility issues. 4. Remove the potential for danger and destruction. We've all read the stories of elderly drivers running into property or causing fatal accidents. You may hurt your parents' feelings by taking away their car keys, but that hurt can be fixed. Be sure you have all the keys. 5. Remember that your adult children notice what you're doing. I've already had the discussion with my kids. If I'm unable to drive with competence, they can take the keys. Maybe. My mother passed away in 2014, and I still feel a bit of guilt for taking her car, but I don't know if those parts have arrived yet. 1. Are You Looking For Bingo Or Competitive Tennis On Thursdays? Some retirement communities have lowered the age-admission bar to 50. But therein lies the rub: Just because they let 50-year-olds in, doesn't mean everyone who lives there is 50. Do you really want to be the only 50 year old in a community where most people are in their 80s? A retirement community can be a little evasive when you ask about the age of residents, in part because it's constantly changing. The average age of residents tends to rise as the community matures, so while the average age of <em>new</em> buyers might be on the young side, you want to be sure you know the average age of <em>all</em> the residents who live there. It's an important distinction. One surefire way to evaluate who your neighbors will be is to check out who the recreational programs cater to. Is it heavy with clubs for marathoners, tennis players and Pilates classes? Or is loaded with offerings like knitting, Mahjong and bridge?